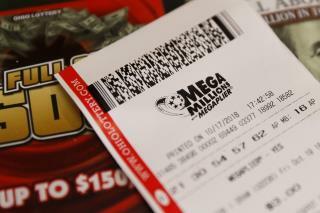 (Newser) – The Mega Millions jackpot has climbed to $970 million, inching ever-closer to the $1 billion mark. Officials raised the estimated jackpot Thursday for the second time due to strong sales ahead of Friday night's drawing. Reuters reports the numbers will be pulled at 11pm EDT. The prize is the second-largest jackpot in US history, behind only a $1.6 billion Powerball prize won in 2016. No one has matched all six numbers and won the Mega Millions grand prize since July 24. That reflects the game's long odds, at one in 302.5 million. The $970 million refers to the annuity option, paid over 29 years. Most winners take the cash option, which would pay an immediate $513 million, reports the AP. About half of the jackpot winnings would go to taxes. Mega Millions is played in 44 states, plus Washington, DC, and the US Virgin Islands. If you're the lucky winner, you can only keep your name secret if you live in one of six states, notes the AP: Delaware, Kansas, Maryland, North Dakota, Ohio, and South Carolina. Click here to read more tips for the winner, or read about a $450 million Mega Millions winner who was just 20 years old. Bread and circuses. Don't demand a higher wage or better conditions ... by a lottery ticket and pretend your rich. I am winning the lottery today. I have the right numbers. I will never talk to you peons again as I am better than that. Have fun at your jobs on Monday, peasants. I threw $2 in the gutter this morning and watched it wash away. Same result.